I have completed my big girl’s first grade report card and second grade educational plan. The education plan is a state requirement (overseen by the city/town). As unschoolers, our educational plans are (to say the least) fluid, but I do my best to create the document, assuming that my big girl’s interests remain constant. (Yes, fellow unschoolers, I realize this is impossible…but I have to submit something!!) Now that I’ve gotten all that paperwork out of the way, on to the good stuff! 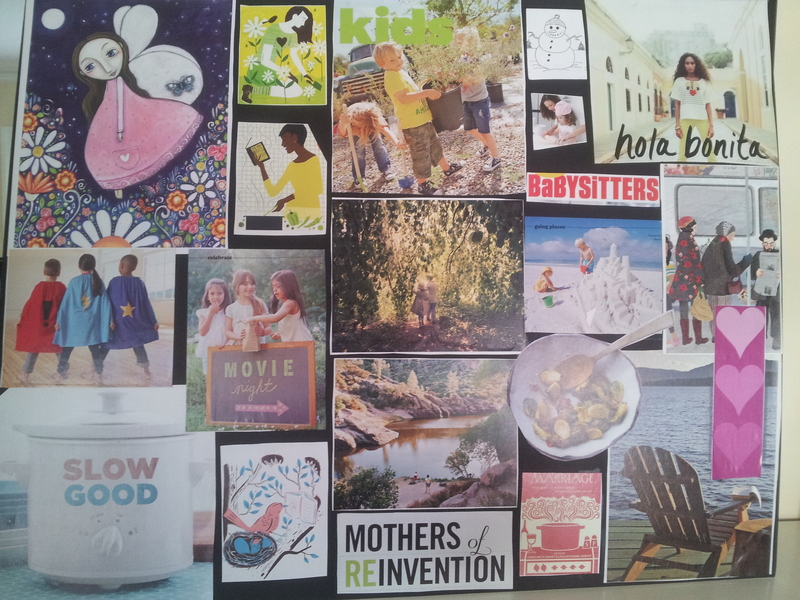 I am so excited to share my 2014-2015 homeschool vision board! As unschoolers, we really don’t know exactly what subject matter the year will bring…ultimately, that is up to our children. But we do know the tone that we want to set in our homes. And I am really happy with how my vision board expresses the learning environment that I hope to create this year. Our main thing will remain pace. A slow and steady pace, with lots of long stretches of time with nothing to do but play and read and bake and craft. And to simply enjoy one another’s company. And we’ll add a secondary goal this year: to immerse ourselves in the homeschool community! To share our family’s many gifts with the community and to build strong friendships within that community. And finally, a really awesome thing about homeschooling is that I, the mother, get to learn new things, too (imagine that?)! This year, my goals are to get my Spanish back into fighting shape and to work on my culinary skills. Mexico seems like such a great place to work on both of these skills. Hmm… Just throwing that out there to the universe (wink-wink! ).